River Daniels lives an ordinary life as a high school junior growing up in the confines of rural Texas until her boyfriend's brutal attack leaves her both a murderer and a fugitive. When River's closest girlfriends come to her aid, they make a hasty decision to not only help her, but leave their own troubled lives behind and join in her escape. The girls manage to elude police for months, but with every near-miss, River's life spirals further out of control, until she finally hits rock bottom. Realizing she must stop endangering her friends and find evidence proving she acted in self-defense, the girls decide to make a risky move. River must face her ugly past and the one person she was trying to protect the night her world caved in, the guy she has loved for as long as she can remember. 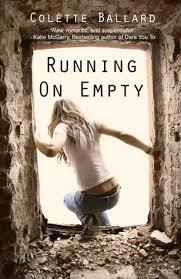 I've had this book for a little while, and in my 2017 quest to finally whittle down my to-be-read pile, I dove into RUNNING ON EMPTY. I loved the premise, and this book didn't disappoint. River is a likable character -- easy to identify with and someone I rooted for throughout the story. Her friends are exactly who you'd want with you if you ever happened to be running from the law. But my absolute favorite part of this book is the romance. The author is amazing at developing the romance between River and Justice. I kept turning the pages, just waiting for something to finally happen between them. If you love a good romance, this is definitely your kind of book. It's so well-crafted, and the tension made want to yell, "Just kiss already!!" The more serious aspect of the book -- River's controlling and abusive boyfriend -- is handled very well, and it makes this book a must-read for any teen girl. Thank you for sharing the review. It seems this book is my type. I wish I could have a close friend like her :) but I think there will be a plot twist.